Poolguys is an experienced swimming pool maintenance and swimming pool repair company, servicing the Valley of the Sun since 1997. 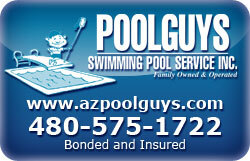 Poolguys is a family owned and operated company. Offering complete pool service and pool repairs to residential & commercial pools in Phoenix, Scottsdale, Paradise Valley, and Cave Creek. Poolguys has a 100% commitment to its customer’s satisfaction!